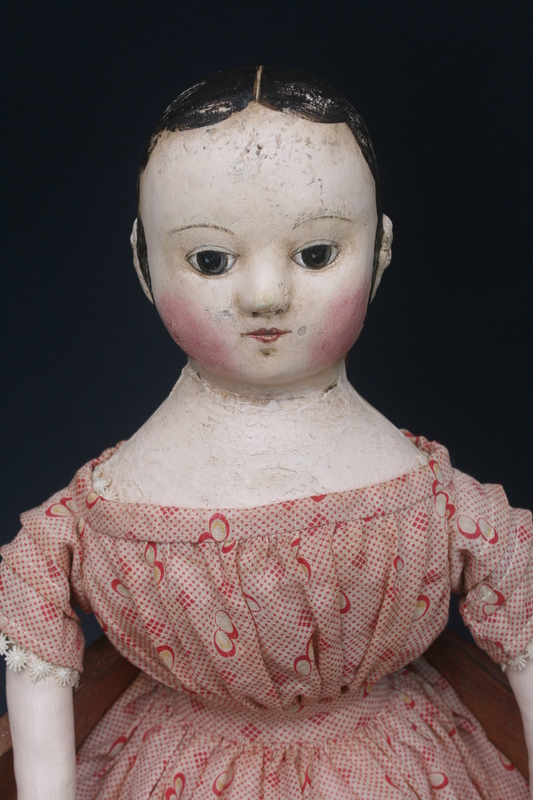 This doll has been sold, thank you for stopping by to see her. Here she is! I just finished her this afternoon. 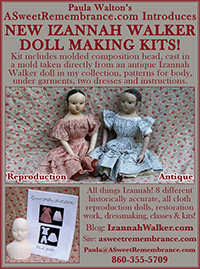 While making this doll I became quite enamored with an Izannah Walker that was very briefly for sale on eBay. 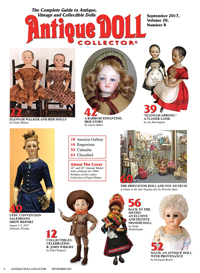 This same doll first came to my attention when it was up for auction at the Sandwich Auction House in April. 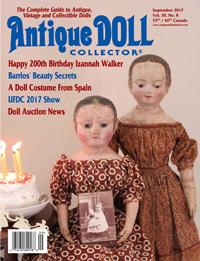 It is similar to an Izannah Walker doll pictured in a daguerrotype owned by Elizabeth Isenburg who writes the Steamboat Arabia blog. 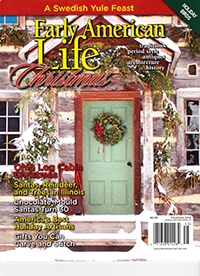 I loved the scalloped waves around her face accompanied by two long curls over each of her ears. I really wanted to paint that hair! 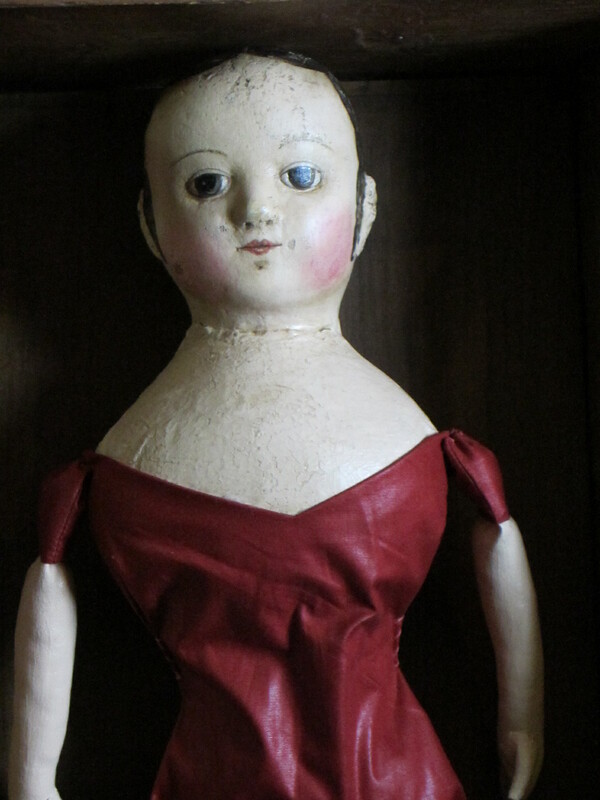 More of a “Rose Red” than a “Lady in Red” or a “Red Hot Momma” she has a second skin made from vintage red polished/glazed cotton. She has a long chemise made from fine antique linen. Her second dress is made from antique red and blue paisley fabric. Rose Red has bare feet. 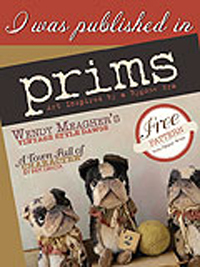 She comes with a chemise, pantalettes, petticoat, red and cream print dress and second dress made from red and blue paisley. $1450.00 If you would like to add her to your doll family, please visit my website where she can be purchased via my secure automatic check out. 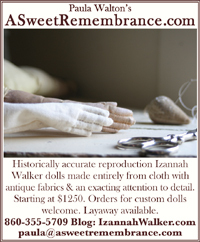 Email or call me with questions (paula@asweetremembrance.com, 850-355-5709) or to arrange lay away payments. You can add socks and hand made shoes, sheer white cotton undersleeves, a bonnet, a necklace, or additional dresses to her wardrobe. Please inquire for the cost of any of these custom made accessories. 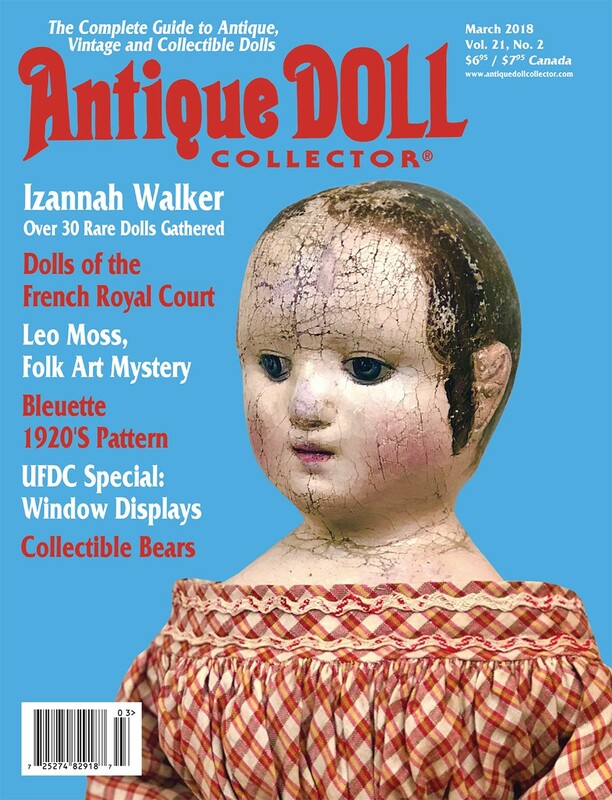 Next Post Izannah Walker Birthday Sale! WonderfulIzannah reprodeuction Paula, I love the fabric choices! Thank you Judi! I don’t always have tons of fabric options, since I almost always use old fabrics, but I think that these all work really well together:) I just love the red print fabric. 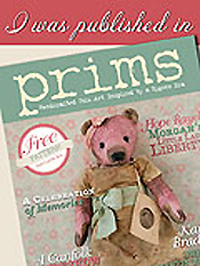 I bought it up in Brimfield, MA in May. As always, I love your work. I hope that you keep doing it for a long, long time.